If you are wanting to see all users availability when creating any event in your own calendar then you need to set up Free/Busy. 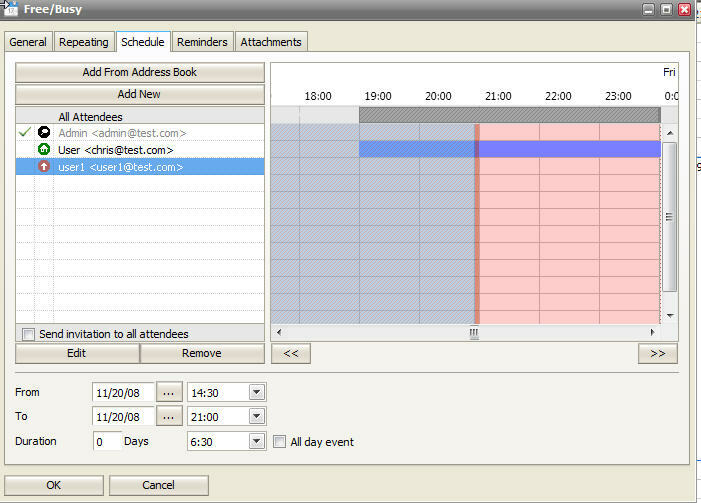 Free/Busy will allow you to see a users schedule when trying to invite them to your event. This will allow you to easily plan and manage meetings and attendees. This is done automatically when using Icewarp Webmail Pro and is possible in Icewarp Mail Server versions 9.4 and after.. To see this follow the steps below. You first need to login to webmail and then go to the [Calendar]. When in the calendar you can create an event and in the window that opens you will see a [Schedule] tab. In the [Schedule] tab you can see the possibility to invite users from your address book to this event or you can choose to create them new. In this example you will see the user "User" was invited. As you can see there is a blue line starting at 19:00 meaning User previously has something scheduled at this time and is busy. You can also see User1 was invited and is free. So, when using webmail PRO you do not need anything extra or added to use Free/Busy. It will work as long as groupware is active and running. 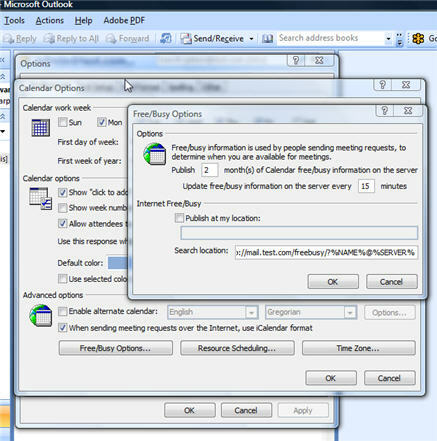 If you are an Outlook user then you would need to configure Outlook to connect to your Icewarp server to see the Free/Busy information for users. To do this you first need to have the Icewarp Outlook connector. This can be found at the link below. Once the connector is installed you then have the ability to contact the Icewarp Groupware server and sync your contacts, calendars, and any public or shared folders. Now that you have the connector installed Outlook needs to be setup to search the Free/Busy information from Icewarp. Open Outlook and go to [Tools, Options, Calendar Options] and you will see the "Search Field". In the seatch field please the URL below. You will need to use your own mail domainame but everything else must remain as it is seen. Everything after the domain should not be touched to always ensure you can perform free/busy lookups. If you have any additional questions on this please open a ticket with Icewarp support so we can assist you further.